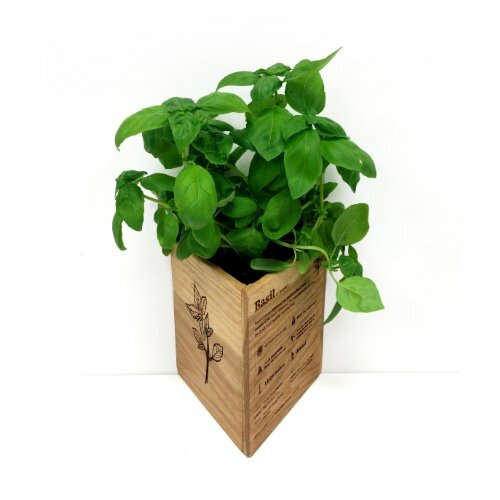 This beautiful triangle shaped basil herb box are made of white oak. One side features an engraved infographic of basil growing tips. The second side features an engraved basil illustration and the third side is just the natural finished oak. The herb box is finished in a food safe sealer and include a plastic liner to protect them for years of service. Please note there are no plants included, they are pictured for illustration only. The herb box measures 6.5 inches tall by 6.5 inches wide. The size is perfect for transplanting small starts from your local nursery. The unique triangle design creates for fun display arrangements including compact rows on a window sill, hexagon arrangements or wall hanging to bring one of your walls to life.